Nicolas M Kyvernitis Electronics Ent, the distributor of Clear – Com and HME in the Middle East, has recently supplied HME DX300ES, wireless intercom communication system to Gamma Engineering, the leading film and TV equipment rental house in the region. The purchased 5-Up DX300ES system with HS15 headsets includes one MB300ES base station, three BP300 beltpacks and three pouches, five HS15 single muff noise canceling headsets and two base station antennas. 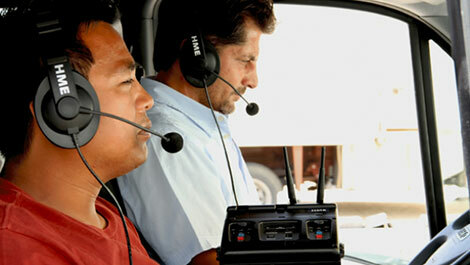 In addition the company acquired two more BP300 beltpacks with HS15 headset and MB300ES base station. The 5-Up DX300ES offers hands-free two-channel mobile intercom system that is able to accommodate larger production crews. The system is the perfect solution for live events and remote broadcast and movie/video production crews, due to its compact design that makes it highly portable, versatile and easy to set up and use. Unique Spectrum Friendly™ technology allows users to select the 2.4 GHz operating frequency range (low, high or full band) to avoid frequency conflicts. For more than 20 years, Gamma Engineering has been leading the motion picture industry in the Middle East through excellence, innovation and creativity forging its reputation for being the Leader and Pioneer of the region, with offices in Beirut-Lebanon and Dubai-UAE. Gamma’s activities and services cover the main areas of the broadcasting and motion picture, from official ARRI System Integrator to rental.